Illustration in the public domain. Crucifixion is a slow and agonisingly painful form of execution “…by which a person is hanged, normally by their arms, from a cross or similar structure until dead.” (Macien, 2006). The victim was nailed or roped or thonged to a large wooden structure, a pole, tree or cross, and left to die in a manner which was “…in every sense of the word, excruciating, (Latin excrusiatus or ‘out of the cross’). (Edwards, 2006). Crucifixion is known primarily from ancient times and in particular with the first century AD execution of Jesus Christ. This pivotal event in the history and development of Christianity was a “…form of punishment…familiar to both Jews and Romans…” (Andrews, 1996), where its intention was the death of the victim. The act of crucifixion was one of the “…most disgraceful and cruellest methods of execution and usually was reserved for slaves, foreigners, revolutionaries, and the vilest of criminals.” (Johnson, 1978). The gruesome execution of Jesus Christ was a humiliating and public spectacle and “…identical to that meted out to numerous other radicals, upstarts, protestors and petty criminals.” (Andrews, 1996), and employed to dissuade others from committing similar offences. In ancient societies there were three brutal forms of execution practised and described as “…crux (crucifixion), crematia (burning), and decollation (decapitation)…” (Retief, 2006). Crucifixion, or impalement, took several forms in antiquity and was “…one of the most brutal and shameful modes of death.” (Retief, 2003). This barbaric form of execution originated with the Assyrians and Babylonians, becoming practised by the Persians in the 6th century BC, as well as the Carthaginians, Macedonians and Romans. In pre-Roman times Alexander the Great brought this form of execution to the lands of the Mediterranean during the 4th century BC. Crucifixion was thus introduced into Egypt and Carthage where it became a systematic and accepted form of execution (Edwards, 1986). It was also Alexander who was said to have, after the siege of Tyre, crucified some 2000 survivors. However, in Pre-Hellenic Greece this form of execution was opposed as too brutal a method by the ancient Greeks so was hardly used. Nonetheless the Greeks of antiquity had two verbs to describe crucifixion. Therefore ana and stauro were derived from the word stauros for stake. The term apo-tumpanizo meant to ‘crucify on a plank’, with anaskolopizo meaning to ‘impale’. The earliest form of crucifixion was being impaled on an upright post or tied to a tree (Edwards, 2006). The English word ‘cross’ is from the Latin term ‘crux’. The later ‘cross’, or what became the ‘true cross’, comprised the horizontal cross-bar (patibulum) attached to an upright post (stipes). These crosses came in various forms and sizes. In the Greek of the New Testament there occurred four verbs based on the term stauros or ‘cross’, hence the common parlance stauroo meaning ‘to crucify’. 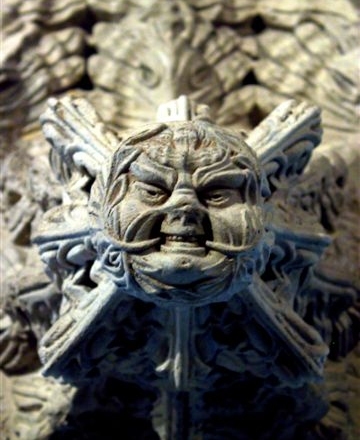 In general terms the word ‘crux’ refers to a framework, a tree, or wooden construction for execution. In English the word ‘crucifix’ comes from the Latin crucifigure meaning ‘to fasten to a cross’. The act of crucifixion was copied from the Carthaginians by the Romans. As an ancient practice archaeology provides evidence of a crucified body in the Roman Empire at the time of Jesus Christ. The Romans had perfected execution by crucifixion by the time Constantine I abolished it in the 4th century AD – after a period of 500 years (Retief, 2003). During the period of the Roman Empire crucifixion was used as a means of punishment but also as a cruel form of public social control (Hengel, 1986). On this basis crucifixion was used, during Roman times, to execute slaves (the so-called ‘supplicum servile’), foreigners, Christians and disgraced soldiers (Retief, 2003). As a result of the Third Servile War led by Spartacus between 73 and 71 AD there were many crucifixions en masse. In this respect the Romans perceived crucifixion “…as a most shameful mode of death.” (Retief, 2006). Crucifixion of Spartacus from the film ‘Spartacus’. Public domain. 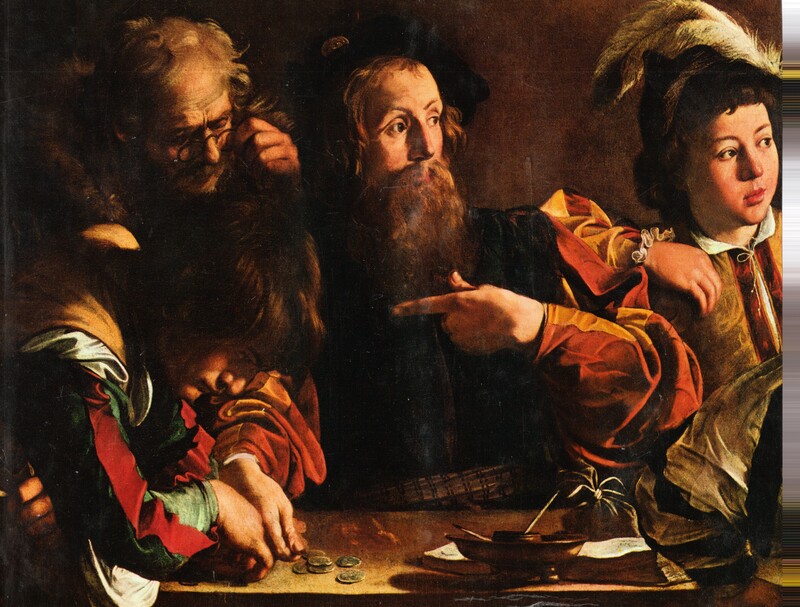 The Romans of antiquity not only employed crucifixion for state enemies, slaves and pirates, but later also for humiliores or members of the lower classes. Victims were suspended by their arms from a cross or similar structure. In other words crucifixion in the penal practice of Rome was used as a means of exhibiting the lower social class victims. The second and first century BC Roman civil wars led to the crucifixion of many as did the destruction of Jerusalem in 70 AD. In Roman occupied Palestine, before its abolition by Constantine I in 320 AD, crucifixion was commonplace. In first century AD crucifixion was used for rebels, for ethnic Jews as well as slaves. This means crucifixion was not a component of Judaic law until after the second century BC. A prelude to crucifixion was the cruel practice of scourging. This flogging was a legal preliminary to all Roman executions (Hengel, 1977), the scourging being carried out by two lictors who whipped the victims back, buttocks, and legs with a flagrum (Masien, 2006). The Roman flagrum of flagellum. Public domain. After scourging the victim was made to suffer the burden of carrying the cross-piece or patibulum to the specially designated site of execution or crucifixion (Thomas, 1987). This obligation in the case of Christ waived and the cross-piece was carried by Simon of Cyrene. Carrying the patibulum to crucifixion site. 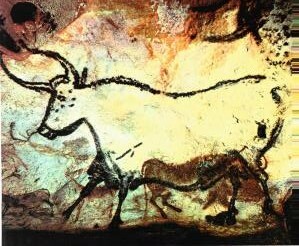 Source: public domain. 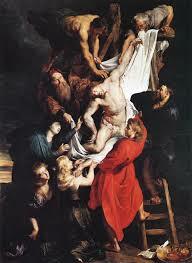 The scourging and execution was commanded by a specialised squad of a centurion accompanied by four soldiers. In the case of Jesus scourging could have reduced him to a state of pre-shock with haematidrosis. The instrument of scourging was called a flagellum or flagrum. 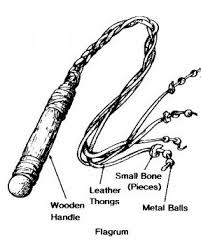 This instrument was a short whip to which was interwoven sharp pieces or balls attached to braided leather thongs (Edwards, 1986; Masien, 2006). Sometimes wooden staves were also used. Scourging inflicted deep cuts and bruises to skin and underlying muscles with concurrent loss of blood, therefore the “…extent of blood loss may well have determined how long the victim would survive on the cross.” (Edwards, 1986). 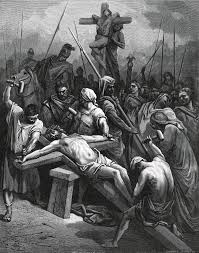 Crucifixion consisted of a variety of ways of impaling the victim to a stake, or affixing to a tree, upright pole or crux simplex, upright stipes with a crossbeam or patibulum. 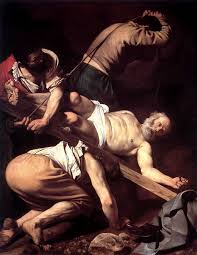 Some forms of impalement meant the hands and feet were attached to the cross using cords, thongs or nails. If this was done to the victim with their head upwards then death could be delayed for several days. Crucifixion in ancient Persia was originally on pole structures or on trees. Originally the Romans crucified by impalement on trees or infelix lignum or wooden post or crux simplex (Retief, 2006). In antiquity “…crucifixion was the ultimate Roman punishment, the cruellest of all forms of death…” (Thomas, 1982). Crucifixion was a most gruesome reality of ancient punishment (Williams, 2013). 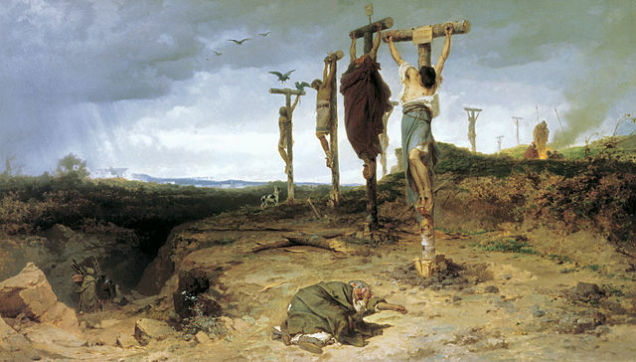 Crucifixion implies the victim was attached to a cross-like structure either by rope or nails, a combination of both humiliation and execution. The method included positional variations, head up or head down, fixed with nails through the wrists not the hands (Williams, 2013). Crucifixion of St Peter (1601). Caravaggio Public domain. The vertical crucifixion stake was, in Latin, called a crux simplex. Most crosses were of the Latin type, the crux immissia, the X-shaped St Andrew’s cross being the crux decusiata. The crux commissia was the Tau cross consisting of the upright post and cross-piece form a T-shape. Some of these gibbets were Y-shaped. 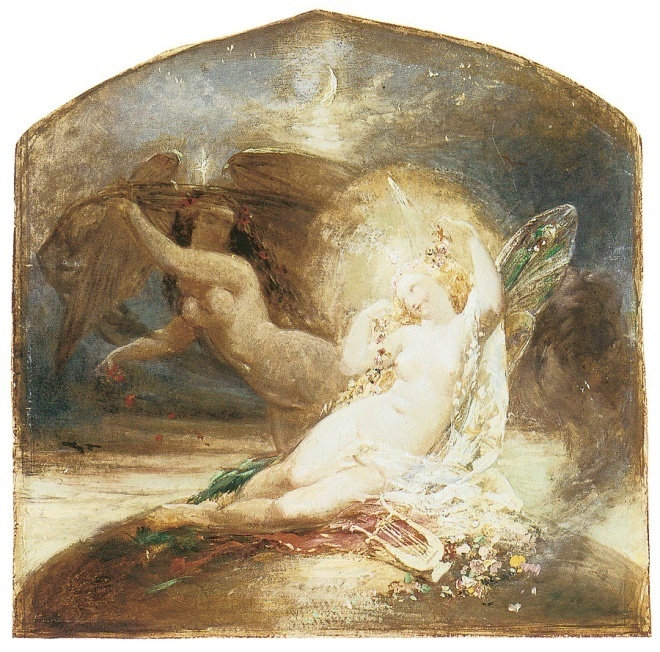 The crux immissia is the most common form found in Christian symbolism. A low cross was known as the crux humilis and the tall form the crux sublimis. Nailed to the post or stipes was the inscription called the titulus. 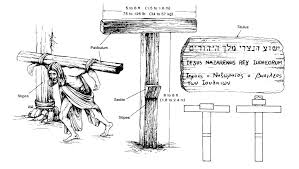 In the New Testament the Greek word for a pole, upright stake or cross was stauros. The term xylon refers to the live tree or wooden construction. 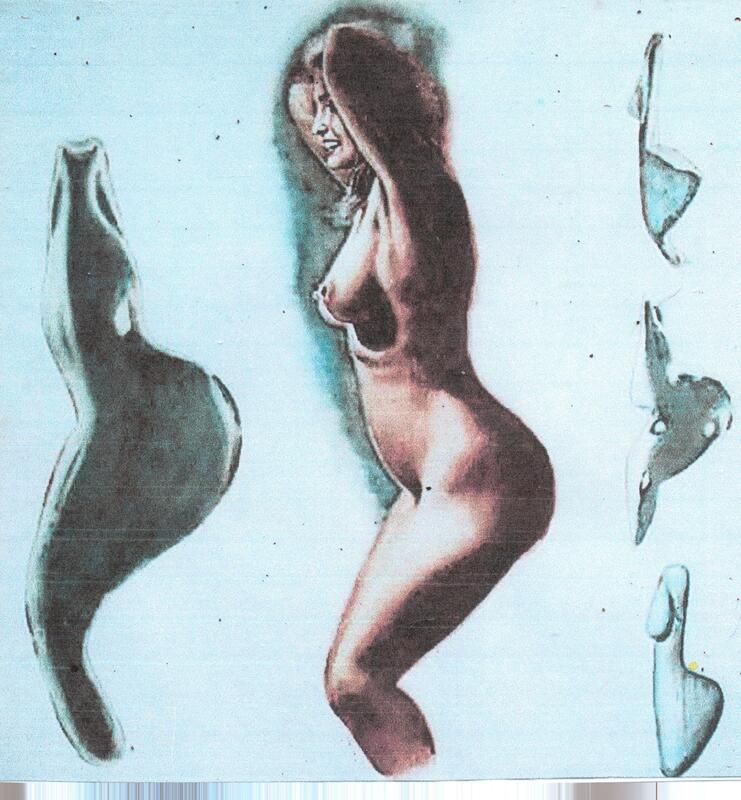 Sometimes the victim’s buttocks, according to ancient sources, were supported by a sedile or sedicula that was attached to the upright. If the support was a footrest nailed to the cross, it was called the suppedaneum. The standard Roman crucifixion, though still debated, required nailing through the wrists. Most crucifixion victims were impaled naked but women were affixed facing the cross (Thomas, 1987). Nailing the feet to either side of the stipes or to its front meant tying with cords was not required. Nailing of the feet also provided adequate support for the suspended victim, with further support ensured by nailing between the radius and ulna of the forearms. From a tomb of Roman times in Palestine there is an archaeological case of crucifixion expertly analysed in 1985 (Zias & Sekeles). The remains showed that a 11.5 cm iron nail had been driven through the right calcaneus laterally to medial. Nailed foot bone from 1st century AD tomb in Palestine. However, even though “…there is no evidence that crucifixion was actually carried out in this way in classical times.” (Masien, 2006), the heels of the remains were nailed to the sides of the cross. No evidence was found of nail insertion through palms or wrists. 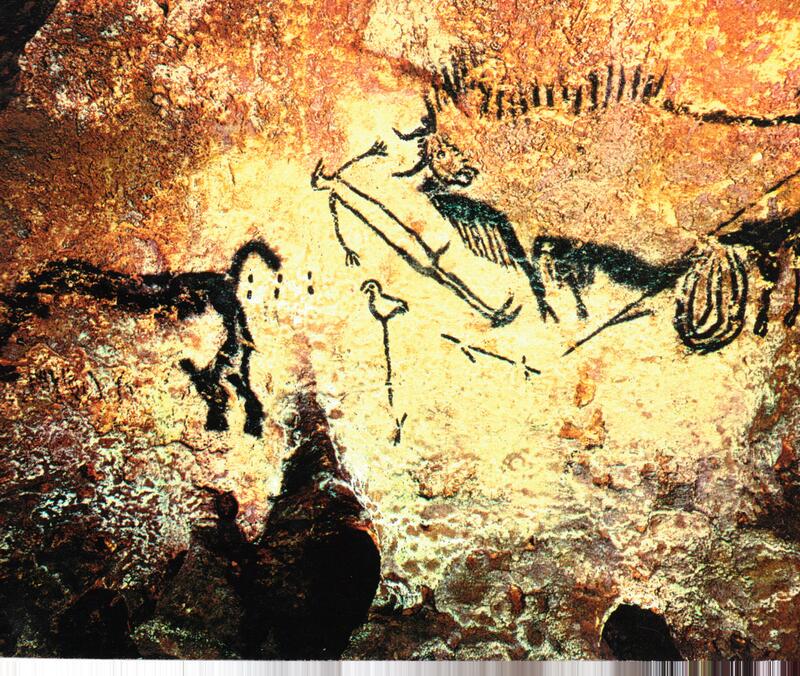 Pictorial interpretations in art tend to show nails passing front to back through the feet. The majority of accounts of the crucifixion of Jesus of Nazareth and his death are found in passages in the New Testament (Masien, 2006). Details of the crucifixion are found in the four canonical gospels, non-Christian historical and other ancient sources, even though exact details vary from place to place, and time to time. The chronology of the crucifixion of Jesus Christ is also derived from the New Testament. Even though there is no con-census on the actual date it is generally accepted that the event took place on a Friday near the Passover. The execution of Jesus Christ took place in the first century AD during the Palestine governorship of Pontius Pilate between 26 and 36 AD. The arrest, trial, sentencing, scourging and execution has come to known as the Passion of Christ. The year of the Passion is estimated to be between 30 and 33 AD with the favoured dates of either 7.4.30 or 3.4.33 AD. Jesus Christ, after enduring both Jewish and Roman trials, was scourged according to custom and then executed by crucifixion (Edwards, 1986). Indications are that Jesus was nailed through the wrists to the patibulum which was then raised onto the stipes, whereupon his feet were nailed as well. The crucifixion as portrayed and described thus becomes “…a study in the agony of a man whose arms and legs – their major nerves possibly cut by spikes – shot shearing jolts of pain throughout a body already ravaged by blood loss from severe whipping.” (Parachini, 1986). Descent from the Cross (1611-14). Peter Paul Rubens. 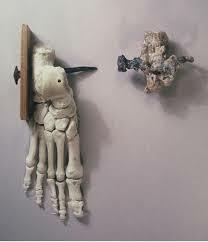 The Romans preferred crucifying victims with spikes some 5 to 7 inches in length (Johnson, 1978; Haas, 1978), with feet affixed either by ropes or nails. In addition evidence from history and archaeology indicates “…the low Tau cross was preferred by the Romans in Palestine at the time of Christ.” (Edwards, 2006). Jesus was offered a wine vinegar drink from a sponge on a hyssop stalk -some 20 inches long – which suggests the cross was of the low Tau type. At crucifixion sites the victim was, by law, given a bitter drink of wine mixed with gall (myrrh) as an analgesic (Davis, 1965). The analgesic and narcotic mixture of wine and myrrh was called exactor mortis (Thomas, 1987). Two beamed cross from Sainte Bible (1866). It was customary Roman practice for a crucifixion guard to pierce the side of the victim with a spear or lance (Edwards, 2006). Sources say the spearing caused a watery effusion, of serous and pericardial fluid preceding blood flow (Bucklin, 1970; Davis, 1965). Even though crucifixion was, relatively, a somewhat bloodless practice, guards would hasten death by the breaking of limbs called crucifracture. The Roman guard would not leave the execution site until it was assumed or assured the victim had expired. An indication of death or its nearness would have been judged also by swarms of flies on bodies as well as the nearing presence of carrion birds (Thomas, 1987). It is believed that at 3 pm Christ cried out live and died (Johnson, 1978), probably because the major “…pathophysiologic effect of crucifixion was an interference with normal respirations.” (Edwards, 1986) as well as hypovolemic shock and exhaustion asphyxiation. With regard to the medical aspects of crucifixion of Jesus Christ a number of theories have been postulated. The ruptured heart theory was put forward in 1847, followed by the theory of asphyxiation, cardiovascular collapse, massive trauma, blood loss and dehydration, as well as hypovolaemic or profound shock theory. The number of theories suggests that in reality “…different individuals died from different physiological causes…” (Masien, 2006). Many physicians have failed to reach agreement on the specific mechanisms of death from crucifixion (Bergeron, 2012) but several hypotheses include: (1) dehydration; (2) cardiac rupture; (3) pleural and pericardial effusions; (4) suspension trauma; (5) fatal spear wounds; (6) cardiac arrhythmias induced by stress; (7) congestive heart failure; and (8) asphyxiation. These contributing factors and postulated causes are all aspects of “…cardiovascular, respiratory, metabolic and psychological pathology.” (Masien, 2006). A major factor is traumatic shock that has been “…complicated by trauma-induced coagulopathy…a contributing factor and possibly the primary mechanism…” (Bergeron, 2012). Hypovolaemia results from a lowering of blood volume resulting from traumatic loss of blood, and was a probable cause of death with exhaustion asphyxia (Lamkin, 1978: Johnson, 1978; Davis, 1965; De Pasquale, 1963). Hypovolaemic shock was caused by circulatory collapse as well as multi-organ failure. Further circulatory involvement would or could include a pulmonary embolus due to leg thrombus resulting from immobilised legs. In addition emboli in coronary arteries would have led to myocardial infarction and death. Crucifracture, the deliberate breaking of the tibiae led to a rapid death, due to asphyxia within minutes. This was known as crucifragium or shelokopia (Edwards, 2006), and was at the time of impending death signified by the not uncommon burrowing of insects into the eyes, orifices such as ears and nostrils, and open wounds of the agonising victims (Cooper, 1883). At this stage of crucifracture death was “…probably commonly precipitated by cardiac arrest, caused by vasovagal reflexes, initiated inter alia by severe anoxaemia, severe pain, body blows and breaking of large bones.” (Retief, 2003). 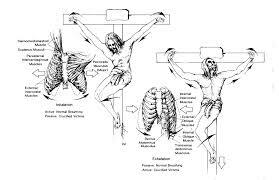 Asphyxiation could occur during crucifixion when the whole weight of the body is supported by the arms, causing hyperextension of the lungs and muscles of the chest. In other words there ensues “…progressive asphyxia caused by impairment of respiratory involvement.” (Retieff, 2003) with hypovolaemic shock and anoxaemia the end result. Crucifixion would lead to the inevitable asphyxiation caused by diaphragmatic respiration, which implies that a “…major pathophysiologic effect of crucifixion, beyond the excruciating pain, was a marked interference with normal respiration.” (Edwards, 2006). Death from crucifixion occurred between six hours and four days as a result of multifactorial pathology. The length of time between the impalement also ranged from hours to days depending on the method used and the health of the victim. Death was also compounded by the pre-crucifixion scourging, maiming, shock, pain, dehydration and haemorrhage, leading to death. Causes of death include “…progressive asphyxia caused by impairment of respiratory movement.” (Retieff, 2006), as well as: cardiac rupture (Stroud, 1871); asphyxia (Barbet, 1953); heart failure (Davis, 1962); arrhythmia (Edwards, 1986); pulmonary embolism (Brenner, 2005); hypovolaemic shock (Zugibe, 2005); as well as acidosis, sepsis, dehaydration, or a combination of all of these factors (Edwards, 1986; Retieff, 2003). The suffering of Jesus Christ, and his redemptive death by crucifixion, became the central elements of the post crucifixion doctrines of salvation and atonement of the Christian church. The crucifixion of Christ has to be seen, firstly, against the historical background of “…the appearance of various messiahs and the use of crucifixion as a form of punishment were familiar to both Jews and the Romans living out their uneasy coexistence in Palestine.” (Andrews, 1996). secondly, only a few medical papers reflect input from historians and osteoarchaeologists. Therefore, without an awareness of all the available research there is “…insufficient evidence to safely state exactly how people did die from crucifixion in Roman times.” (Masien, 2006). From the evidence that is available it appears that the execution of Christ was “…identical to that meted out to numerous other radicals, upstarts, protestors and petty criminals during the whole period…” (Andrews, 1996). 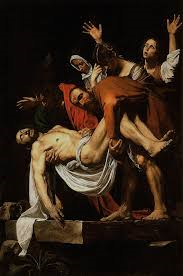 Entombment of Christ (1603). Caravaggio. Public domain. Archaeological and historical evidence contradicts the images of the crucifixion portrayed by the church. 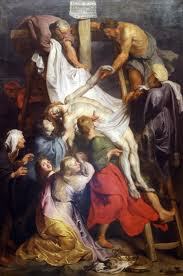 For example, the Turin Shroud has been claimed to be the funereal wrapping of Christ’s crucified body. However, the evidence of Zugibe (2005) indicates the shroud “…appears to be a medieval forgery, dating from between 1260 and 1390 CE, since the fibres taken have been radiocarbon dated by three separate laboratories.” (Damon, 1989). During the Roman period it was not common for anyone to die on the cross within the first few hours (Masien, 2006). If the death of the victim happens after only three to six hours then this suggests the “…possibility of a catastrophic terminal event.” (Edwards, 2006). The implication is if only after a matter of hours on the cross death occurs, the actual cause is “…multifactorial and related primarily to hypervolemic shock, exhaustion asphyxia and perhaps acute heart failure.” (Edwards, 2006). Therefore death after only a short period is surprising (Lamkin, 1978; Bucklin, 1970; De Pasquale, 1963). Usual crucifixion procedures meant it was “…customary to leave the corpse on the cross to be devoured by predatory animals (Edwards, 2006), a process known in ethnography and archaeology as encarnation (Tenney, 1964; Hengel, 1977). After the crucifixion the body of Christ was removed from the cross and placed in a prepared tomb owned by Joseph of Arimathea. If, as some believe, the victim was drugged and only appeared to die, then recovery could be attempted later (Masien, 2006). This implies that the ‘risen’ Christ had in fact been resuscitated. This in contradiction to the fact that crucifixion was intended as a “…long slow method of death, lasting over days and even weeks, deliberately chosen to give a slow agony.” (Thiering, 1992). In addition, well after the gospel described events, the name ‘Christian’ was not adopted until after 44 AD. Again, another suspicion is that the descriptions by the apostles were not contemporaneous. It also follows that Petrine and Pauline Christian doctrines and theology were developed at a much later date in Rome. 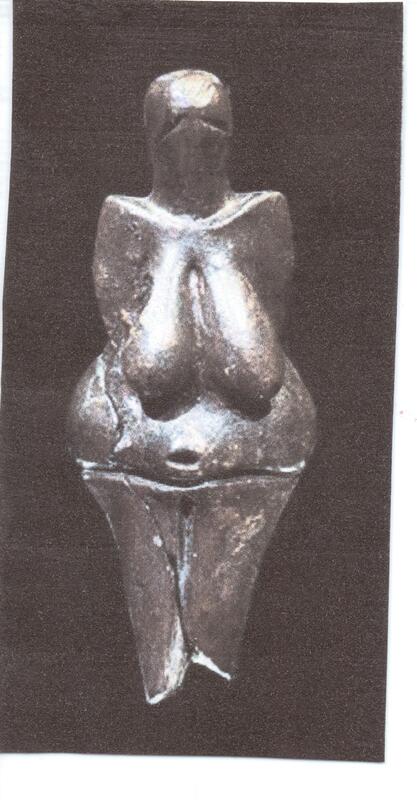 The atonement and the Passion were sublimated within the background of local pagan and ancient seasonal resurrection rituals to produce the new religion of Christianity- the elevation of the ‘Virgin Mary’ the replacement of the ancient Great Mother goddess. Other interpretations, assuming that Christ was removed from the cross alive, tended in a readied ‘tomb’ for three days by an Essene physician called Nicodemus, and then ‘resurrected’ to his followers. Followers and attendants who included Mary Magdalene. Henceforth, it has been conjectured, Jesus having made ‘the supreme’ or having been the ‘supreme sacrifice’, “…remained with his followers for many years after the crucifixion…for the most part in seclusion…” (Thiering, 1992). Other theories postulate journeys to Egypt, and India, and even the fortress enclave of Masada. Andrews, R. & Schellenberger, P. (1996). The Tomb of God. Little, Brown & Co, London. Baigent, M. (2006). The Jesus Papers. Harper Element, London. Ball, D. A. (1989). The Crucifixion and death of a man called Jesus. J. Mississipi State Med. Assoc. 30 (3). Bergeron, J. W. (2012). The Crucifixion of Jesus. J. Forensic and Legal Medicine. 19 (3). April. Bucklin, R. (1970). The legal and medical aspects of the trial and death of Jesus Christ. Sci. Law. 10. 14-26.
Cooper, H. C. (1883). The agony of death by crucifixion. NY Med J. 38. 150-153. Damon, P.E. et al. (1989). Radiocarbon dating of the Shroud of Turin. Nature. 337. 611-15. Davis, C. T. (1965). The crucifixion of Jesus. Ariz. Med. 22. 183-187. DePasquale, N. P. & Burch, G. E. (1963). Death by crucifixion. Am. Heart. J. 66. 434-435. Edwards, W. D. et al. (1986). On the Physical Death of Jesus Christ. J. American Medical Assoc. 255 (11). March 21. Hengel, M. (1986). Crucifixion in the Ancient World. SCM Press, London. Inglis-Arkell, E. (2013). This is the horrible way that crucifixion actually kills you. Daily Examiner, USA. June 12th. Johnsson, C. D. (1978). Medical and cardiological aspects of the passion and crucifixion of Jesus, the Christ. Bol.Assoc.Med.PR. 70. 97-102. Kersten, H. & Gruber, E. R. (1994). The Jesus Conspiracy. Element Books, Dorset. Lamkin, R. (1978). The Physical Suffering of Christ. J. Med. Assoc. Ala. 47. 8-10. Macien, M. W. & Mitchell, P. D. (2006). Medical Theories on the cause of death in crucifixion. J. Roy. Soc. Med. 99 (4). April. Parachini, A. (1986). Christ’s Death Under Medical Examination. Los Angeles Times. 28.3.1986. Picknett, L. (2003). Mary Magdalene. Robinson, London. Primrose, W. R. (1949). A surgeon looks at the crucifixion. Hibbert J. 382-386. Retief, F. B. & Cilliers, I. (2003). The History and Pathology of Crucifixion. South African Med. J. 93 (938-41). Tenney, S. M. (1964). On death by crucifixion. Am. Heart. J. 68. 286-287. Thiering, B. (1992). Jesus the Man. Corgi, London. Thomas, G. (1987). The Trial. Bantam Press, London. Zias, J. & Sekeles, E. (1985). The crucified man from Giv’at ha-Mivtar. Israel. Explor. J. 35 (22-27). Zugibe, F. T. (1988). The Cross and the Shroud. Evans & o, New York. 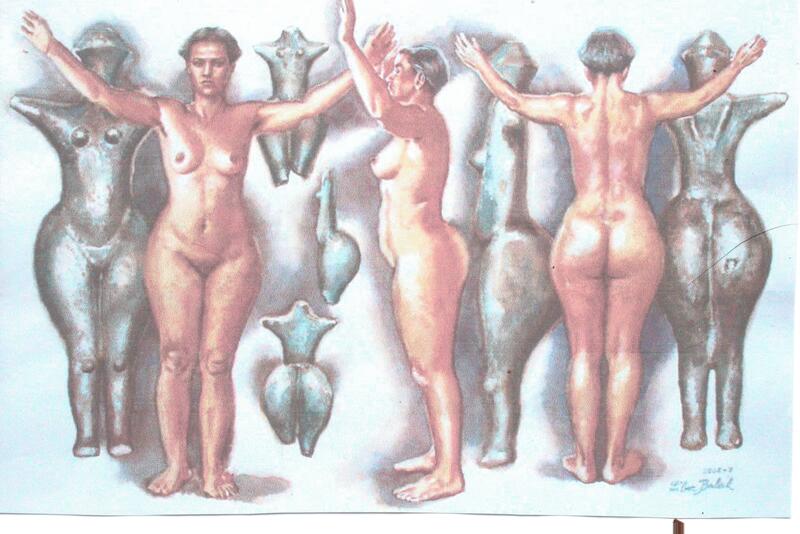 Zugibe, F. T. (2005). The Crucifixion of Jesus: A Forensic Enquiry. Evans & Co, New York.